I’m very proud of myself. I finally got bitten by the spring cleaning bug and cleaned up just about every nook and cranny of the house (and there are lots of them!). When I was sick (for two months! ), I just let the dust bunnies multiply and the fridge got gross. I will spare you the details, but as someone who is usually a total neatnik, I’d been very down about my space. 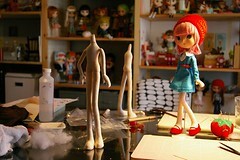 One big problem I was having was that I was making dolls at my tiny kitchen table. It’s about 5 feet round, and visible from the main room of my little condo. Just a constant mountain of fabric scraps, doll heads, and thread monsters, making it impossible for the room to feel tidy and forcing us to eat dinner on our laps. Something had to be done. I re-arranged the spare bedroom (the furniture placement was horrible and I didn’t like even going into that room) and now I love my craft space.The room actually feels bigger, even though the desk is now square in the middle of the room and I moved all my craft supplies in there. It just feels like it’s inviting me to come in and get right to work. The first order of duty was to put it to use! Paul and I worked all weekend in that room, and we managed to finish two-and-a-half big pose dollies. These dolls use the pattern from dolly dolly 16, with slightly different materials after I made a prototype that needed a bit of improvement. I LOVE this body pattern. I’ve adjusted mine a bit to give her longer legs and slimmer hands – the original pattern has large hands that make it hard to dress her in sleeves with small cuffs. 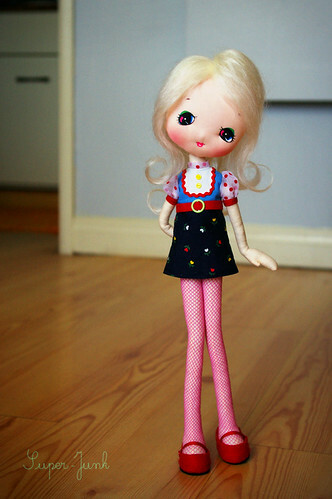 Oh, and did I mention that they fit Blythe clothes? Instant wardrobe! They have difficult-to-fit feet, so socks and tights have to be super-stretchy. 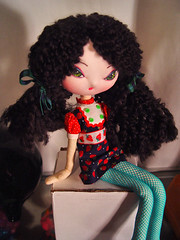 I need to buy a case of Volks fishnet tights! Here’s my second girl. Her face was a little inspired by one of the sweetest little pose dolls I have ever seen, Eve. While I was painting her, I just kept thinking of what it would be like to be a fly on the wall while someone painted a vintage doll – I bet they did it in about 5 brush strokes! This face took me about 3 hours, including letting the paint dry between coats and practicing first on a styrofoam-ball-head. I like her a lot, but need more practice so that I don’t have to stress about shaking my hand and screwing up the eyelashes. Paul made one too. He did a great job, despite my constant interruptions to give him instructions (It’s the “teacher” and bossy big sis in me). She’s got sparkly green eyes, just like daddy. While I was agonizing over getting skinny yarn to lie flat on my pink-haired girl, he decided to give her big fluffy black curls, which worked out wonderfully and went on so fast! I decided to make my second one a mohair girl, which I think may have been even faster. I wanted her to look like a fuzzy baby chick. They are kind of a hybrid between Pose dolls and plush dolls. their limbs are wired so they pose really well, but their bodies are all cloth and fiberfill like a plush doll. If you use the pattern as it is, the doll is about 13 inches tall, but my little blonde has a couple of extra inches in her legs, so she’s 15″. They also can stand on their own if you make their feet really stiff, which is fun for photos. I think I will keep the two I have made so far for myself, only because they still have some flaws I want to work out, but I would love to make these to sell if there is interest in them. It’s fun to watch them come to life! Anyway, I know I went off course from the tiny dolls for a bit, but I just had to try this pattern. I’ll be working on another batch of the micro pose dolls in the next few weeks.